Have you ever noticed how often we repeat ourselves? I’m not talking about retelling the same story over and over, though that can be annoying. I’m talking about reliving the same story over and over, (you know, the one), about being trapped in our own behaviors. But, my eyes are open. We feel so wonderful when we finally walk down that other street. Guess what? Dang, if there isn’t another hole in that street. The potholes are everywhere. 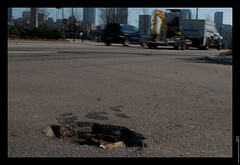 Somebody ought to do something about those dang potholes – and that somebody is us. They’re our potholes and once we take ownership of our potholes, then we can take action. Sometimes we recognize our pattern and ask for help. Sometimes we just keep going down the same street for a long time. Actually, there are probably holes that I’ve fallen in waaay more than four times. I may be on Chapter 100 for some of the holes in my street. One of my potholes is rage. When I was very young, just a newbie in the work world, I quit a job because the man who owned the business scared me. His rages reminded me of my father. Often, he wasn’t raging at me, but it still scared me silly and I quit. Over time, I’ve run across the same situation over and over. Now, I’m conscious of it, but it still is one of the holes I fall into. I don’t run away any more, but I still struggle to maintain my equanimity in the face of any form of rage. The good news is that we are learning creatures. From the individual cells in our body to our whole body and up through families, friends, work; human beings are learning creatures. We are designed to learn. Sometimes we get frustrated because it takes us so long to learn, but we continue to learn, even when it seems to take forever. Recently I wrote How to Learn Faster. In it I confessed that I learn slowly because I believe I know better. In my arrogance, I take what I think I “know” and use it to modify what others are trying to teach me. What’s truly amazing about this strategy is that I choose to become a student and then ignore the teacher. When I was young, I had the arrogance of youth. Now I have the arrogance of middle age. How ironic!! And here is the wisdom of “There’s a Hole in my Sidewalk.” It is so true! Portia Nelson has created a poem which, if we pay attention, shows us how we learn the psychological and emotional lessons that we need to learn. We don’t all need to learn the same things, but we seem to use the same process. It’s like the instructions on your bottle of shampoo – “Shampoo, rinse, repeat.” We encounter a problem. We figure a way out. We keep living and amazingly, the problem shows up again. We repeat the cycle. Once we accept ownership, then we can take action. Once I accept that falling in the hole is my “fault” then I can choose to walk around the hole. The key to learning is about accepting my role in where I am. Acceptance gives me power. If I am at least partially responsible for where I am, then I can choose how to respond next time. I can choose to walk around the hole. I can even choose a new street.